You'll have to excuse me, I've just had a massive oven cook up and accidentally eaten two types of roast dinner this evening (honey & mustard lamb rack with wok charred dark soy brussel sprouts; and slow cooked pork with roast apples and fennel)! So no blogging tonight, and more on that later. I'm in a food coma! 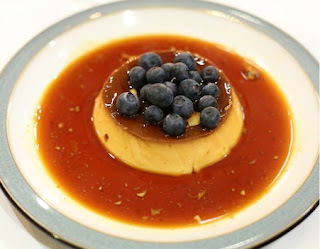 There are multiple creme caramel recipes out there, using exactly the same ingredients that this version calls for. 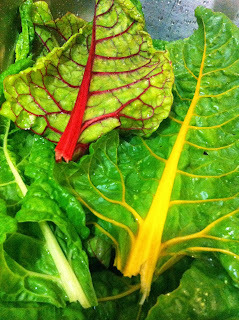 However, most recipes give imprecise quantities (e.g. specifying measurements in cups), or give dangerous cooking suggestions (e.g. 180C oven!). If you follow these instructions, you will be rewarded with a smooth, bubble-free, and really eggy creme caramel. This recipe does not call for any special equipment other than a digital probe thermometer, which I suggest you buy because it is a worthy investment. Assuming you have 250mL ramekins, this recipe will make enough for 8 serves. Pour the salt and sugar into a saucepan then pour the milk on top of it (this stops the milk from catching and burning at the bottom). Split the vanilla bean and scrape the seeds out, then add to the milk. Heat the milk to 80C, then turn off the heat and allow to infuse for 1 hour. Meanwhile, make the caramel (recipe below). Add the cooled milk to the egg yolks and eggs, then beat until incorporated. Strain the mixture, discarding the vanilla skins. This will get rid of any bubbles and egg shells. Mix the sugar and water together and bring to boil in a saucepan. Prepare your ramekins, making sure they are dry. You will need to work fast as soon as the caramel is made. You will find that the caramel will continue to darken in the pan, and will easily pass the burnt stage by the time you reach your sixth ramekin if you do not take precautions! As soon as the caramel starts to take colour, observe it closely. Just as it passes golden brown, remove the pan from the heat and immediately plunge the bottom of the pan into water in the sink for 15-20 seconds, making sure you do not get any water into the caramel. This will cool the pan and stop the caramel from overcooking. Immediately pour the caramel into the prepared ramekins, swirling the caramel to coat as high up the sides as possible. Work quickly - it helps to have an extra pair of hands to complete this stage. Preheat the oven to 90C, fan forced. This is a much lower temperature than is typical in most recipes, and the reason is simple - high heat causes liquid to boil, boiling liquid produces bubbles, and bubbles in your creme caramel produces a rough texture. Choose a baking pan which will fit all 8 ramekins. Line the bottom of the pan with folded tea towels, making sure that it is absolutely flat. If your ramekins are tilted, you will get lopsided creme caramels. 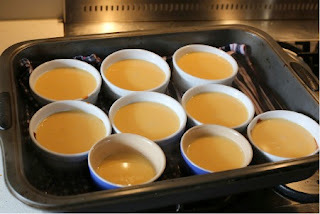 Pour the creme caramel mixture into the prepared ramekins. Let rest for a few minutes - any bubbles will rise to the top. Pop the bubbles by passing a blowtorch very quickly over the liquid. Cover each ramekin tightly with foil, then poke a few holes to allow steam to escape. Place the ramekins carefully onto the folded tea towels in the baking pan. Boil enough water to reach 2/3 the height of the ramekins, then pour into the pan. Bake the creme caramels at 90C for about 60-90 minutes, or until a probe thermometer reads 82C. Turn off the oven, leaving the door open. Allow the caramels to cool to room temperature unmolested (about 2-3 hours). Note - if you try to remove the caramels too soon, they will cool too quickly and shrink, leaving cracks. Chill the caramels in the fridge. Before serving, immerse the ramekins into boiling water for 60 seconds, then run a knife around the edge. Invert a plate over the ramekin, then turn the whole thing the right side up. The caramels should unmold easily. Garnish and serve. Definitely one of my favourite ever desserts! Might even convince me to try making sweets a bit more often! Thanks mate! 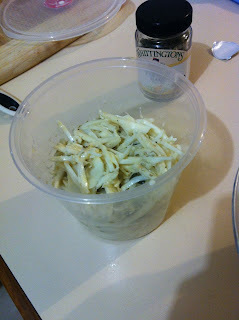 I absolutely love celeriac, and celeriac remoulade, that most European of dishes, is no exception. I made it the other night to bring to our family's regular "Fish'n'Chip" night at my sister's house, and describing it over the phone I came up with "it's like a very fancy, delicious coleslaw". It tastes like celery flavoured root vegetable if you are wondering, but there's just something about it that is some kind of magical. I love Celeriac Mash (slice off the stems and tough outer skin, chop into pieces then boil with equal parts milk and water; drain and mash. AMAZING! 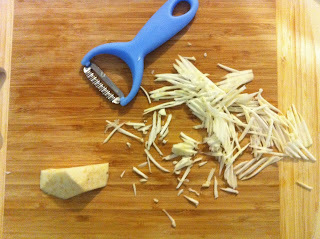 You can also combine with equal parts potato pieces if you want a starchier texture.) I've mentioned it before in this blog post. The other way I use it is as a side for roasts. Roast Celeriac did feature at my Father's Day lamb roast lunch this year. 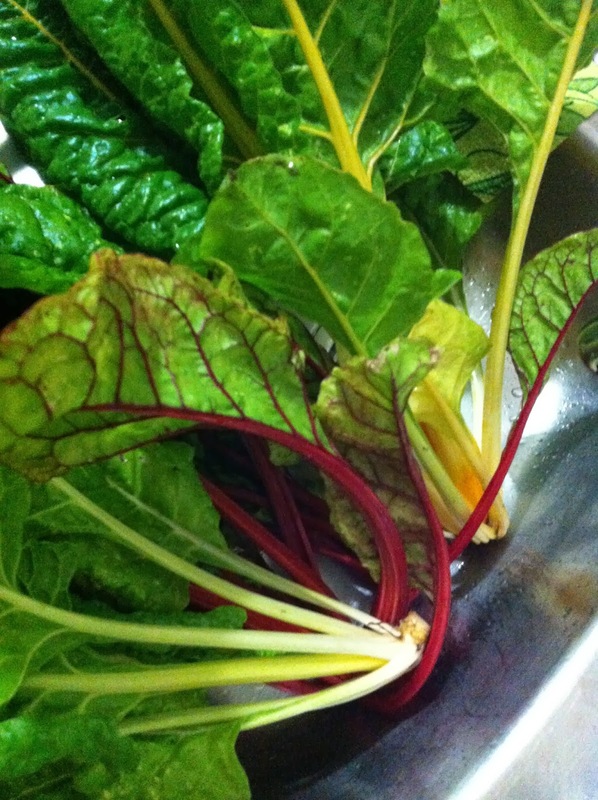 Simply slice off the outer skin then cut into wedges or batons, apply oil, salt & pepper and roast as you would for any other root vegetable. So morish! So, Celeriac Remoulade seems like a difficult thing as I find it features on menus in french bistros and fancy restaurants over here, but I was determined to give it a go. Fortunately for us, we have the delightful Neil Perry at Rockpool, who is always open to sharing his recipes, plus google gave me a few more gems, such as this classic recipe from Nigel Slater. It worked well but was quite labour-intensive as the celeriac was just that little bit hard, and slippery. 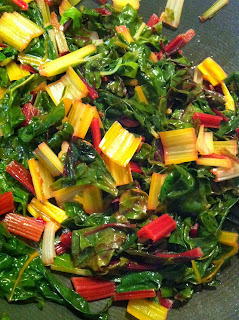 I don't actually own a food processor, but if you do, I think this dish would be so easy to make, you'd just slip in the julienne blades and "wazz" it up as Jamie Oliver says. Fortunately I have unearthed most of my kitchen stuff from over east (the injuries haven't helped with unpacking! ), and my big mandolin was floating around, so I was able to julienne in a timely fashion (you can't be late for fish and chip night! Soggy fry up! What a disaster!). 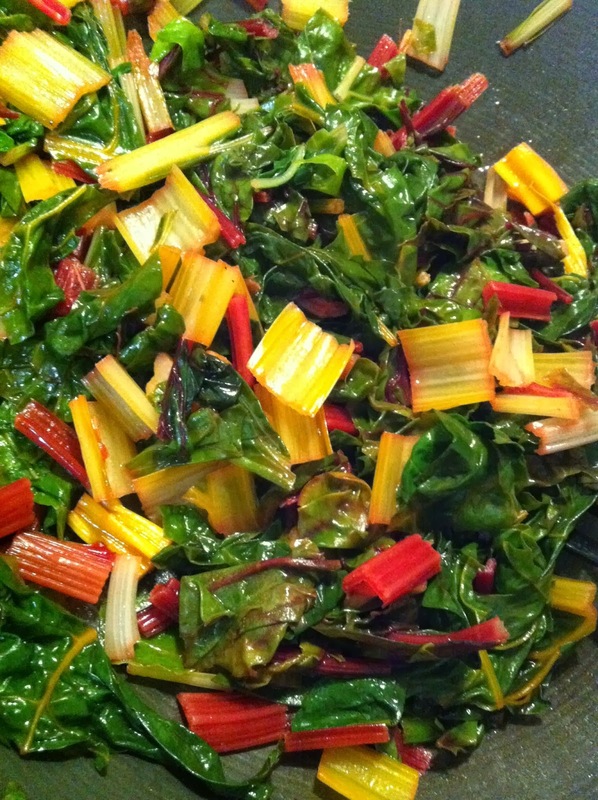 So once that pesky julienne problem is overcome, it's actually a remarkably simple dish to make, just a classic combination of taste sensations! 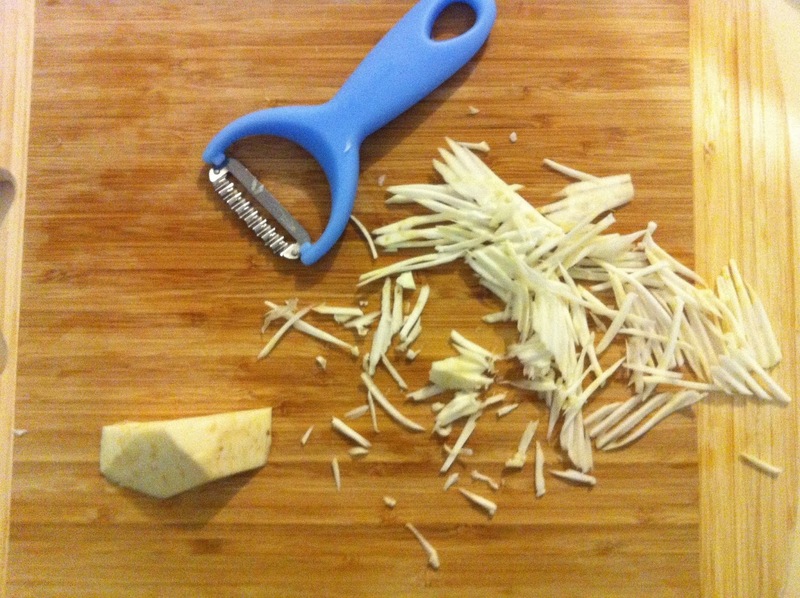 Julienne the flesh of one celeriac (stems and outer skin removed) and immediately place in acidulated water. Combine several generous dollops (3-5 tablespoons) of whole egg mayonnaise and 1 large dollop of dijon mustard. 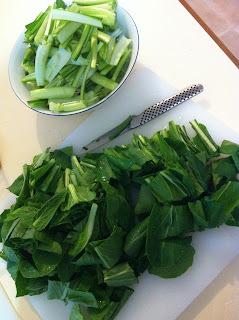 Rinse and chop three cornichons and 1 tablespoon of capers and mix into the dressing. Add a large pinch of dried parsley because it is too cold to go outside to the herb garden to harvest fresh dill, parsley and watercress, and you don't feel like braving the slugs. Squeeze in the juice of half a monster lemon (having recently harvested an entire vegie drawer's worth of lemons from the monster tree in the front yard). Decide to leave out garlic that some recipes suggest as your sister has a weird aversion to it (she thinks she can feel it oozing out of her pores the next day). "I don't know, you don't make friends with salad." "Come on, it has whole egg mayonnaise in it, it's hardly a purist's salad." So, I have a big list in my mind of dishes I'd like to conquer, and Hokkien Mee was pretty high up there. A friend on Facebook had been posting lots of amazing food photos (he has far more technique than me!) but when we got into conversation about this delicious South East Asian staple, he said dejectedly that he didn't have a good recipe that would allow a "cook at home" Hokkien Mee. Now, I am aware that there is no hope of having as great a version as the true hawker style, side of the road, middle of the markets Hokkien Mee at home. The noodles have to be dark, almost black, with additional charring and dryness that you simply can't get from a domestic stovetop, there just isn't as much heat. However, it's still nice to have a "home version" of most things, so here is my take on the dish from a couple of weeks ago. First I consulted the interwebs to get some inspiration and found two versions of the recipe, one I will refer to as the "Dark" recipe and the other as the "Lard" recipe. In my mind, it's noodles, very fine slices of char siew and choy sum which sing out from this dish. The additional ingredients are somewhat flexible. 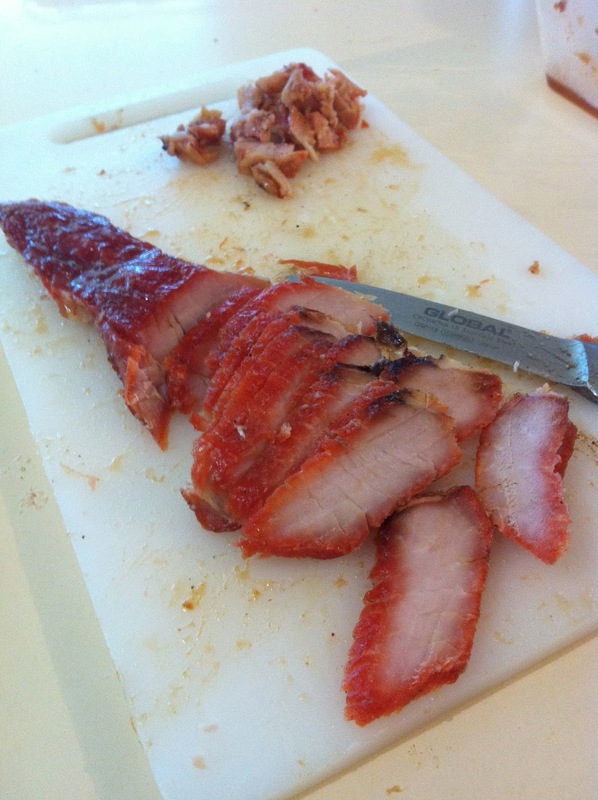 So to start with I sliced a large piece of uncarved char siew (which my parents had kindly brought over last time we had a roast duck/bbq meats takeaway dinner) as finely as I possibly could, pulling off the fat first (see below). 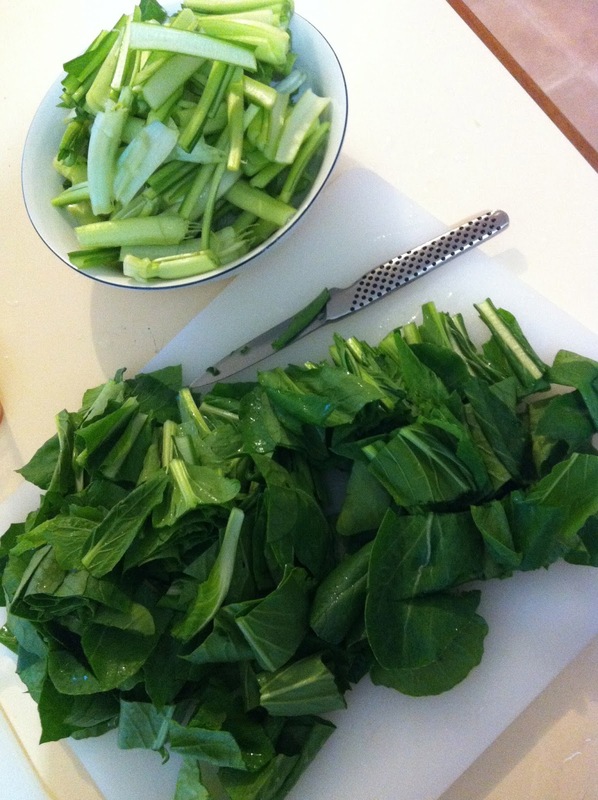 Then chopped the choy sum into fairly uniform pieces, splitting the stems and the leaves (as they cook for different amounts of time so this alters the order in which they should hit the wok). I can't remember what the packet instructions were for the noodles but I followed them as with any noodle dish (some need pre-boiling, others you can just pour over some hot water, some need soaking in cold water). 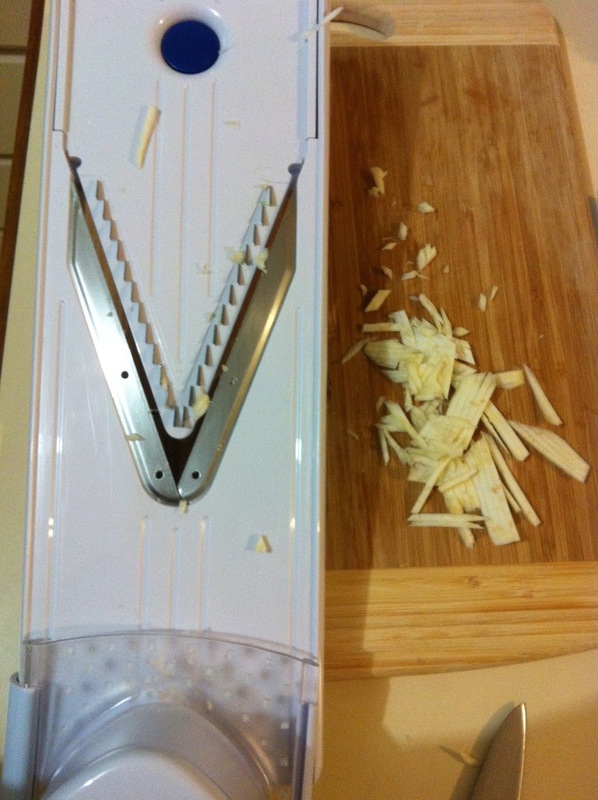 Then the standard taste combo of finely diced garlic, matchsticked ginger and long pieces of onion (but I used shallots as that was what I had in the fridge). As the "Lard" recipe was so adamant on the need for fat, I also chopped up the plump strips of lard/pork fat that I had saved from the char siew into a dice to add to the wok with these initial "flavour injectors". I felt like I needed just one more texture so I went with a tin of oyster mushrooms that was rattling about in the back of the pantry. Again I opted for long strips which I find more pleasing to have in stir fried noodles (we've already discussed the importance of shape and grain in stir fry, and my hatred of inelegant chubby diced pieces they sell at the store, I'm sure). Marinadey sauce - pour over some dry sherry or rice wine, a sprinkle of sugar then LOTS of dark soy sauce. 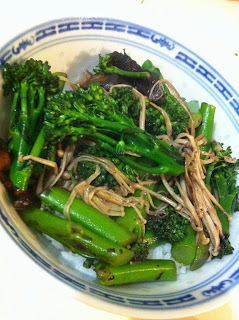 Noodles - add the prepared noodles and stir to coat with sauce and mix through the other "stuff" (in chinese we refer to the "stuff" that isn't rice or carbs as "soong" ie the vegies and the meat). 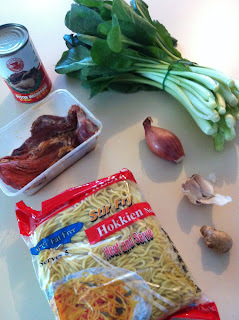 ...but it wasn't quite Hokkien Mee. I ended up adding LOTS and LOTS more dark soy sauce and it almost looked like the Hokkien Mee of my mind's eye. It was quite delicious! In the end, the secret was discovered a day later, when I pulled out a smaller amount from the batch as leftovers and re-wokked it. Having a small amount in the wok allowed for much higher heat distribution and I managed the get the charred, dark, dry look I was hoping for; and the taste was even better than before. So if you are struggling to get enough heat despite having a thin, large wok with a large, hot flame, perhaps try making a teeny tiny batch, or pulling out smaller portions to char up after the initial batch is made. The re-fried leftovers were so delicious I completely forgot to take a photo of these later versions! A good endorsement!